Today was spent at Dawlish, a small seaside resort town half an hour outside of Exeter. I have to say I LOVE Dawlish. It’s as though time has stopped still here capturing the quintessential english town. There is a river that flows through the middle of the main street to the beach. Festooned along the river is bunting and coloured lights. On either side of the river are old churches and the bowling green overlooks the entire town. You just know that this is what it looked like in the 50s when the town was filled with post war promise and the lights along the river could sparkle rather than be blacked out against the bombs. I was last here 25 years ago and nothing has changed. Well, one thing. A new addition on the river are the frequents posters of Cedric the Duck. 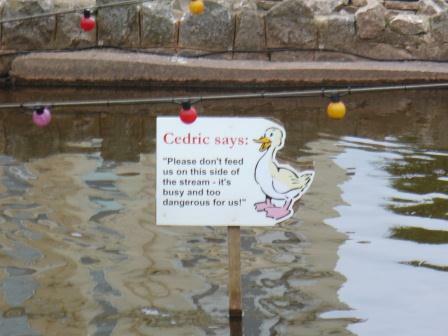 Cedric is a cartoon duck that offers initially helpful advice about how to best protect the swans that live in the river (“Don’t feed the seagulls” says Cedric). However as you go further and further along the river Cedric keeps appearing to become so increasingly demanding and directive that you begin to feel that Cedric may have neofascist leanings. But this is not what you are here to learn about. Dawlish is home to the third food wonder of the world and, like the town, has been around since the fifties. An unassuming shop called Gay’s Creamery houses the holy grail of ice cream.The most amazing ice cream ever. 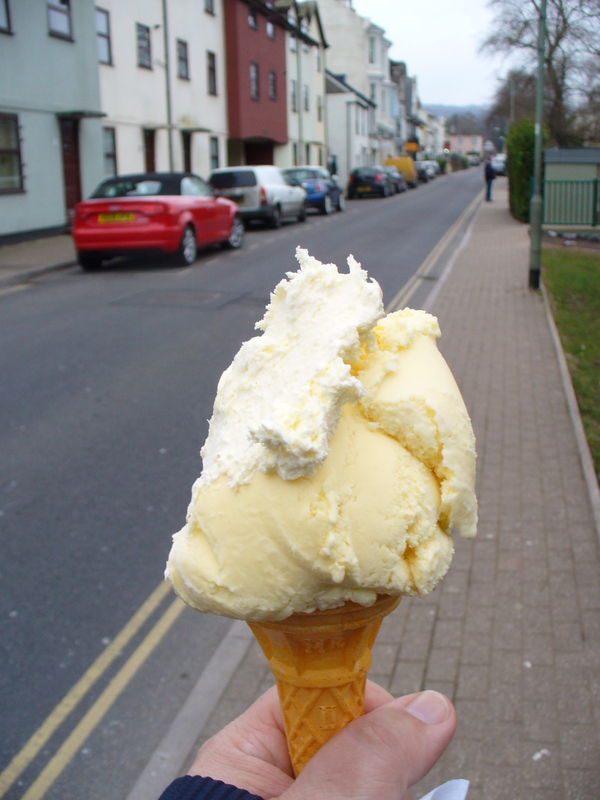 A hearty scoop of Cornish Ice cream. a hearty scoop of Devonshire clotted cream on top. Cornish ice cream is velvety and tastes like frozen gold. Clotted Cream is the food of the Gods. Together they are power house of taste sensation. The cream freezes on the ice cream and becomes nuggety frozen explosions of taste in your mouth. It cannot be described how good these are. Just know that if you’re ever in Dawlish you MUST go to Gay’s and get this ice cream. Your heart may not thank me but your taste buds will.